In May 2010 I got myself a busking licence and decided to hit the streets of Sydney to get back into the swing of all things musical - and also to try an earn a little bit of tax-free cash on the side, of course ;) After only a few sessions I've come to realise it's an enjoyable, mind-opening pasttime, perfect for getting my performance chops back up to scratch, which is what I need if I want to start gigging again after I release my upcoming album. Yet on the other hand it's also highly challenging and disconcerting, especially considering I used to play music professionally, where for much less effort, I earned about a hundred times more than what I've banked out on the streets! 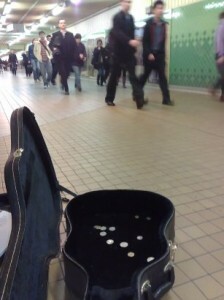 So here, I have decided to notate my experiences as I foray into the world of amateur, cover-and-original-singing, acoustic-guitar-playing street performance. Come with me and find out about the songs I sing, the people I meet, the enjoyment, the disappointment, and the coinage - or should I say, the lack thereof!